Have you been diagnosed with a chronic illness or a food allergy and think that your diet is now destined to be limited or boring? Are you unsure of what you can or cannot eat on your low-carbohydrate/low-sugar, low-fat, low-salt, gluten-free or other “Special Diet” and are looking for ways to eat fabulous, yummy food? 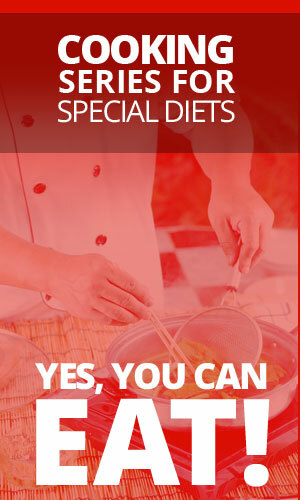 Do you just want to learn new cooking techniques or new recipes that include ingredients that your physician or dietitian has told you are included on your prescribed diet? Cook delicious meals that fit into your dietary requirements, are fun and easy to prepare, and will delight your friends and family. Each class will focus on a different “Special Diet” that is associated with a different chronic illness or food allergy. You will leave these classes with dietary information regarding your specific medical condition or allergy and with recipes that you will love to prepare at home! You will also learn that your future is destined to be gourmet, fun and delicious! Registration For A “Yes, You Can Eat!” Cooking Class will begin on August 17, 2015.